I was recently given a blog post for publication on a client’s website. It was honestly the worst formatted and most terribly written Microsoft Word document that I’ve ever seen; a complete client horror story. It had basic typos, repetition, grammatical errors, inappropriate formatting– the works. 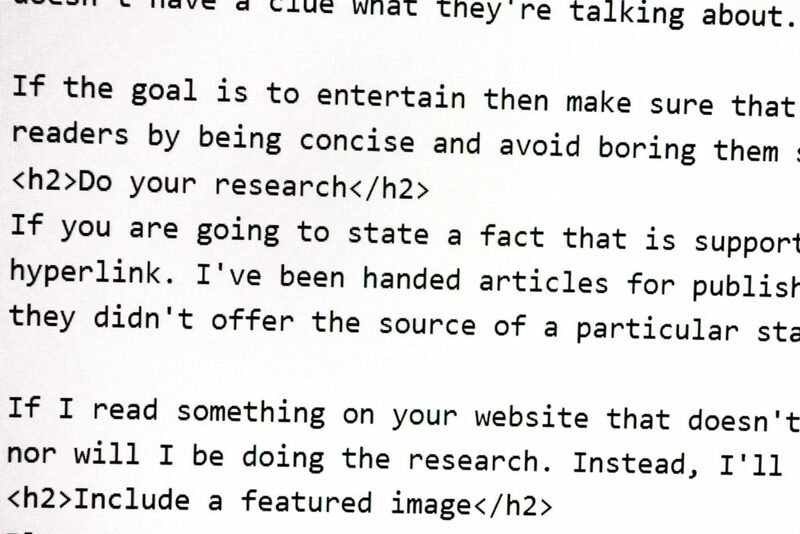 It really got me thinking, so I chose to write some tips on correctly writing for the web. The colors of the article are going to change over time as the website’s CSS changes. The website handles all of the colors, and writers should not concern themselves with the design of a post, the website should. If you have concerns about how a website looks in terms of readability or branding, then please communicate this to the appropriate contact at the respective company. Giving someone a blog post in a font like Helvetica Neue isn’t going to do either of you any favors. Please don’t use any form of font than the standard one that your word processing software uses when dealing with web content. The HTML output from the word processing software should not include any mention of fonts. It should be very simple and clean looking, like the example source code for this article in the featured image. Please don’t use bold on your titles, instead use H2 and possibly H3 tags, if appropriate. Never use H1 on anything except the title; there should be only one on every page of a website. Using a heading tag also means that you needn’t underline anything in your blog posts because the H tag system allows your post to be consistent with the styling schema of the website on which it is going to be published. Titles are not a place to use list tags either. If you’re a content writer or blogger without an editor, then proof-reading your own work is part of your job description by default. The most successful and most popular writers in the world all use spell checkers, and so do their editors. You are not too good to use spellcheck, nobody is. Using spellchecker does not mean you are a bad writer; writers get it done and worry about the formatting and everything else once it’s down in a tangible form called a ‘first draft’, believe it or not. Please, at least use the basic one built into Microsoft’s Word on OneDrive, Google Docs, LibreOffice or OpenOffice. There really is no excuse not to when so much of this office software is available to use for free. If the title of the blog post is about x then the contents should be about x, and not drift into y and z. If you begin a blog post with a particular opinion that you are trying to convey, then finish the post with the same opinion– otherwise it’s very clear that you’ve hired a very poor content writer, or the author simply doesn’t have a clue what they’re talking about. If the goal is to entertain then make sure that what you write is actually entertaining, if it is meant to be informative then make sure you actually inform your readers by being concise and avoid boring them senseless. If you are going to state a fact that is supported by evidence or research that isn’t widely known, then please cite your source, preferably in the form of a hyperlink. I’ve been handed articles for publishing without any citations, yet they make bold claims that would raise eyebrows and really hurt their credibility if they didn’t offer the source of a particular statistic or pseudo-scientific claim. Even a Wikipedia article link is appreciated, if it isn’t a university essay! If I read something on your website that doesn’t cite a source for a fact, or there is a statistic that seems outrageous, then I won’t be returning to your site, nor will I be doing the research. Instead, I’ll be finding a website that does provide this information, and stick with them. Blog posts that have featured images are better in terms of SEO, especially if the image is unique and exclusive to that website, so contribute a photo you’ve taken, if possible. Everybody carries a camera in their pockets now, because they have smartphones. If you’re hired to write content, then it is preferable to at least include a licensed Creative Commons 3.0 image that is appropriate for their application, or an otherwise relevant royalty free image. This takes 30 seconds, and saves frustration before publishing, and you’ll be sure to get further business from your client. Flickr is a great place to grab Creative Commons 3.0 images, but remember, always contribute original images when possible as your content will be far more valuable. If you do use an image that is Creative Commons, or another applicable license, then credit the author in the blog post itself, with a link to where you found the image, and the license that it is used under. Unless told otherwise, the default featured image format is horizontal and a minimum resolution of 1920px x 1080px, as that’s the current go-to way of formatting images on the internet because most consumer-level devices are at least 1080p. The average consumer surfs the web with their display in the widescreen aspect ratio and landscape orientation, be it on their laptop, their desktop computer, or sometimes even their phone and tablet. The likes of Twitter and Facebook format their timeline covers in a landscape orientation, along with their OpenGraph images, so until the user interface changes, it’s time to follow the trend. Fashion bloggers, this applies especially to you! The time it takes to correct all of these amateur mistakes is money down the drain for most businesses, and is frustrating work to do, especially if the post is several thousand words long and you’ve got a series of them to edit. It also means that the author of the posts wasted their time by having their formatting removed and redone. As for the client that sent us the badly written blog post that prompted this article to be written, we of course won’t be naming them. We initially cut ties with them after discussing the matter and informing them that the quality of content they provided had gone significantly downhill and made us look bad. A few weeks later we started negotiating a new contract with them, and we’re now writing content for them, and they’re thrilled with the results! If you can’t write to save your life and are damaging your business with badly written blog posts, content, or articles, then it might be time to consult professionals. We provide a content writing service and have many happy clients, and we would be more than happy to help you. By outsourcing your writing to people whose job it is to create engaging, search engine optimized content, you free up time for yourself to better run your business.